We said that we’d be back soon with another blog post following up our original post about common LED lighting myths, so here we are! In the interest of properly informing our readers about the incredible benefits, longevity, and versatility of LED light bulbs, New Edison Lights is back at it again to bust some more of these all-too-common LED lighting myths. These eco-friendly lights are only out to save your business valuable time and money, so what’s up with all of the fuss online? We think it’s pretty fair to say that even our eco-friendly lighting solutions aren’t immune from the bowels of misinformation from the internet, but hey, that’s why we’re here now. Check out what makes New Edison Lights different than our fellow LED lighting competitors here! 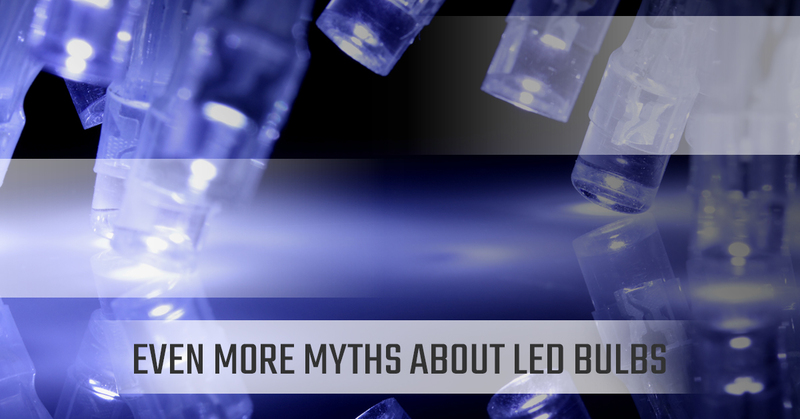 Now, we’re going to continue putting a light on these LED light bulb myths. Admittedly, it would be pretty difficult to form a sustainable business model if all LED light bulbs simply ran forever. So, no, LED light bulbs do not last forever, but they do last significantly longer than the average light bulb. Like all light sources, LED lights eventually fade over time. However, what’s really cool about LED bulbs is that they will keep shining almost as brightly as they did when new for most of their lifetime, whereas many other conventional light bulbs will noticeably fade until they go out. Actually, LEDs shine with their full light output almost instantly after switching them on. LED light bulbs can also be switched on and off continuously without shortening their lifespan. This is contrasted to fluorescent lamps and energy-saving twisters that come on slowly or even flicker as they’re turning on. The truth, yet again, is quite the opposite – LEDs actually become more efficient and last even longer when used in cold temperatures. Excessively high temperatures (we’re looking at you, Arizona) can actually shorten the life of electrical and electronic components, which is partly why traditional incandescent lamps don’t last very long. Running an LED lamp in even the coldest of climates is hardly an issue. Take that, adverse weather conditions! While not all LED light bulbs are designed to be dimmed, many of them are. LEDs are digital, meaning that they are either on or off. This might make LEDs sound like they can’t be dimmed, but they can be – they’re just switched on and off so rapidly that our eyes can’t notice it. Just keep an eye out for the dimmable logo on LED light packs, as in many cases you can use your existing dimmer switches. Just remove your current lamp and replace it with a dimmable LED lamp. Helping Companies Save Money And Energy: A Win-Win! What business doesn’t want to reduce their costs while reducing their impact on the Earth? Our Longmont eco-friendly lighting solutions are beyond worth looking into if your business hasn’t made the switch yet. Learn more by scheduling a lighting audit or getting in touch with our eco-friendly lights experts at New Edison Lights! Schedule A Lighting Audit With Us Today!